The Blubrry Team had an incredible, educational andÂ inspirational long weekend, Oct. 14-18,Â at the Blogworld and New Media Expo. And not just the kind of inspiration you see in the photo below,Â rather we gave and received valuable insights about the Blubrry PowerPress, podcasting progress and the people in our communities. Â WeÂ were able to meetÂ some great people, catch up with friends and spread the word to bloggers and podcasters that blogging louder through RawVoice and Blubrry is more than just an option, it’s the option. True, socially our highlight of the weekend wasÂ the Blubrry Vegas After Party at the famous Peppermill Fireside Lounge Friday night, Oct. 16. 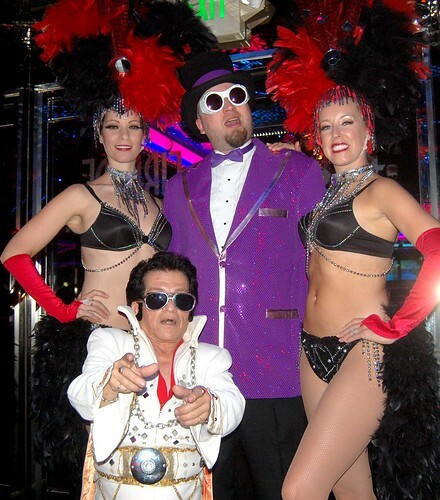 The strolling magician, DJ’s tunes, showgirlsÂ and of course Little Elvis set the toneÂ and pushed the kitsch over the top atÂ the Peppermill. Yeah, we can honestly say this was our best party yetÂ — because you told us so. Thanks to everyone whoÂ attended and made the event such a success! A special thanks to our organizers, Aileen Kenny and Mat Luschek.Â We hope they’reÂ not busy next year. Even more importantly, we look forward to seeing you there next year! Being the podcasting gurus that we are, you guys might think we know it all . . . and a lot of times we’d probably like to think so as well. But, know what? We don’t. You all have a lot of critical information and amazing insights that will help us improve Blubrry.com. So right here, right now, we’re asking you to take a second or two, ponder a few questions, make a few suggestions and help us to make Blubrry.com more compelling and inclusive than ever.